Are You Setting Up Camp in the Right Place? Getting the most out of a camping trip comes down to a few different factors. You need to have the right supplies, be prepared for the unexpected, and have a decent campsite. The location of your campsite determines how dry you will be when you are sleeping, how easy it will be to get a fire going, how well you can see your surroundings and more. We have a few tips we would like to share with you about choosing a location for your campsite. First of all, try to choose a clear area. This is especially important if you are going to be build a fire. You don’t want your fire to catch onto any branches or shrubs, so choose an area that has enough space for the fire to be away from everything else. You also want an area that is mostly dirt and not rocks or grass. If there is a lot of grass at your campsite, then the fire can catch onto that. Rocks make for an uncomfortable sleeping place, even if you have a decent sleeping mat and tent. Elevated camping sites are good ideas too. If your campsite is too low, it is likely to get flooded or at least overly damp when rain falls. Higher elevations give you less chance of flooding and let you see the surrounding rea. That means you can watch for animals and incoming problems long before they get to you. A flat area is desirable as well for your campsite. The more level the area is, the less likely your pots and pans will go rolling when they drop. You will also have less trouble getting comfortable when you sleep. Campsites should be close to resources as well, such as public restrooms, a river or a parking spot for your vehicle. Having your vehicle nearby means you can access all the resources within it. Public restrooms in proximity mean that you won’t have to make up your own outdoor restroom and won’t be as inconvenienced. Having a water source nearby gives you a way to easily clean clothes and utensils as well as cool off during the midday sun. You also want to make sure you set up in an approved campsite. There may be some areas of the park or campground where camps and fires are not allowed to be built, so pay attention to the rules and regulations of the camping area before you set up. You may also want to talk to the operators of the campgrounds or park to find out their recommendations. Your campsite is an important part of your camping experiences. 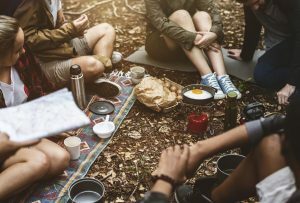 You may not have a lot of options if you go to a busy campground, but you should also keep these guidelines in mind as you try to choose the best site for your camp. If you do, you will have a more enjoyable experience and be more likely to want to do it again.